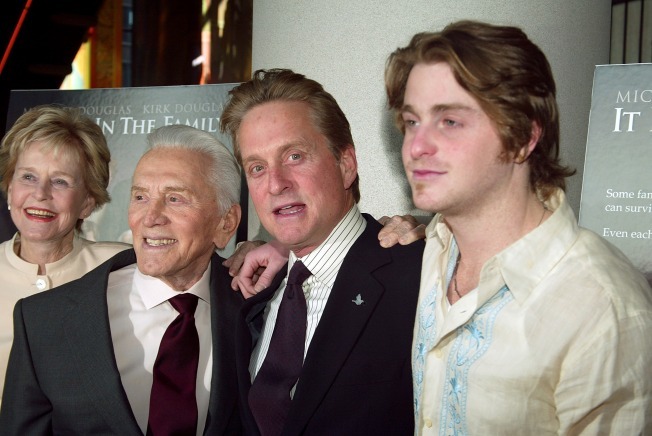 Kirk Douglas, Michael Douglas and Cameron Douglas appeared together in "It Runs in the Family." It was the summer of 2009, and Cameron Douglas was strung out on heroin — again. Holed up in a trendy Manhattan hotel, the wayward heir to Hollywood royalty — son of Michael, grandson of Kirk — was shooting up sometimes six times a day. His own stabs at stardom had mostly gone nowhere. But notoriety found him when federal agents showed up at his hotel door to cast him in an unwanted role: methamphetamine trafficker. The 31-year-old's real-life drug drama in a court has since laid bare the details of his downward spiral — which friends blame on a toxic mix of privilege, neglect and a family legacy of substance abuse — and his loved ones' deep despair over it. "I must admit that my immediate reaction when I learned of my son's crime was one of guilt," his mother, Diandra Douglas, wrote in one of several letters from supporters asking a federal judge for leniency at a sentencing scheduled for next week. Said actress Catherine Zeta-Jones, married to Michael Douglas: "My stepson is a caring, considerate, worthy human being, but nevertheless the disease that he has for years tried to combat did take over again." The Drug Enforcement Administration declines to discuss the investigation. But court proceedings, including Cameron Douglas' guilty plea, and documents indicate he has given information in hopes of being spared a minimum sentence of 10 years in prison. Supporters of the son of an Academy Award-winning father who once played a drug czar in the film "Traffic" recount a childhood handicapped by his parents' erratic, fast-lane lifestyle. Defense submissions also note a history of substance abuse by his father and three uncles. Michael Douglas' publicist said the family wouldn't comment. Cameron Douglas' mother, 12 years younger than his father and the daughter of a diplomat, had the couple's only child at 22. At the time, she possessed "a striking immaturity about her," wrote family friend Patricia Sullivan-Webb. Several letters say Douglas was left in the care of nannies while his father put his acting career first. His mother became so fanatical about wildlife preservation, she tried keeping an ocelot in the family's New York apartment until it bit her son and was sent back to the preserve, Sullivan-Webb said. Douglas tried to fit in by playing youth football, wrote childhood friend John Rickard. "Most of the kids on the team picked on Cameron severely because he was Michael Douglas' son," he said. "He just wanted to be treated like a normal kid, which never seemed to happen." By 13, Douglas had been shipped off to boarding school and began smoking marijuana. As his parents' marriage fell apart, he turned to cocaine. A series of rehabs and relapses followed. He later dropped out of school and returned to New York, where, despite his habit, he found some success as a DJ in clubs. A friend who hired him, Jen Gatien, wrote that he was "an absolute hit" behind the turntables. He also landed some film roles, including one in 2003's "It Runs in the Family," starring his father and grandfather. Another hopeful sign: After his parents divorced, his father picked him as best man when he married Zeta-Jones in 2000. But by 2004, Douglas was hooked on heroin and well on the path to self-destruction. Gatien wrote that she had no choice but to break off their friendship that year. "His new 'family,' as he called them, was a group of fellow addicts who took over his life," she wrote. "No one had jobs or responsibilities. ... Cameron was the sole provider." Defense lawyers say that after his father failed in 2006 to persuade Douglas to again get treatment, he cut off his son from the family fortune. That's when, the lawyers say, their client decided to make ends meet by dealing meth. For three years, DEA officials say, Douglas supplied over 5 pounds of meth to New York dealers — a large amount for a city where the drug has mostly a niche market in the gay community and on the club scene. The city has averaged about 14 pounds in seizures since 2005. Federal agents, alarmed by an influx of Mexican-produced meth being smuggled into California, were investigating suppliers there when DEA cooperators helped put Douglas on the radar. A criminal complaint filed last year said that in a 2006 deal, an unnamed cooperator shipped cash under a fake name to Douglas at a California hotel. A few days later, it said, Douglas delivered a pound of methamphetamine to the cooperator at a Manhattan hotel. In 2007, another cooperator said, Douglas was paid $48,000 at a Manhattan apartment. The cooperator later received a pound of crystal meth in New York through FedEx from Santa Barbara, Calif., the complaint said. Douglas' lawyers say he traveled to New York last summer hoping to "clean up." He moved into the luxury Hotel Gansevoort in Manhattan's Meatpacking District. His drug addict girlfriend, Kelly Sott, moved with him — a recipe for more trouble. "Her emphatic commitment to Cameron led Kelly to adopt the same drug habit that he had acquired — in her mind their joint drug addiction made tighter their emotional bond," according to court papers filed on her behalf. In June and July, Douglas met a cooperator to negotiate more deals, first over dinner, then in conversations secretly recorded on wiretaps of cell phones and the cooperator's hotel room in Manhattan. In one conversation using code words, investigators said he spoke of "sending out a pastry" to a cooperator and asked, "Did you get a chance to ... smell any of the salts or anything like that?" Agents arrested Douglas on July 28 at the Gansevoort. He was given house arrest at his mother's Manhattan apartment but was thrown in jail after Sott tried to smuggle him heroin inside an electric toothbrush — an offense that led to her own guilty plea on drug charges. Last month, Sott was sentenced to time served after telling a judge she'd kicked drugs while behind bars. Douglas' lawyers have argued he deserves 3 1/2 years in prison at most and he, too, is looking forward to redeeming himself and leading a sober life once he's out. "I have told Cameron to dream a dream that will truly fill his heart, not what others expect his dream to be," his mother wrote. But a psychiatrist who has treated Douglas, Robert B. Millman, testified that his road to recovery will be rocky. "I hate to say it," Millman said, "but he needs to be rebuilt."